Elliott’s bold adventuresses, complex quests, noble sacrifices, and hard-won victories shine in classic, compact legends. In “The Memory of Peace,” a girl’s powerful emotions rouse the magic of a city devastated by war. Meeting in “The Queen’s Garden,” two princesses unite to protect their kingdom from the blind ambition of their corrupted father. While “Riding the Shore of the River of Death” a chieftain’s daughter finds an unlikely ally on her path to self-determination. Why did I read this book: I am a Kate Elliott fangirl – the good news is that I have a lot of her work to catch up with. The bad news is that it will take me quite a while. Woe. Last year I went to Fantasy Con in England where Kate Elliott was a Guest of Honour. Actually, scrap that, I attended Fantasy Con because Kate Elliott was a GoH. Over the course of that weekend, I attended several of her panels as well as an incredible In Conversation With Kari Sperring event. In those, the author talked the many themes explored in her fiction; how much thought goes into creating the worlds in her novels especially how every single decision affects worldbuilding in a domino effect – everything has consequences, everything is choice. One of the most important themes in those panels and presentations was the depiction of women in her fiction, the importance of featuring a variety of portrayals, settings and arcs as a means to represent the varied, rich lives of women. I don’t write fiction but as a reader, editor and budding publisher, I was able to take away a lot of useful, thought-provoking information from simply being there. Now, many months later, I could see how all of those were put in practice in her fiction when reading The Very Best of Kate Elliott. The collection is the first from an author who has published over 20 novels in the course of a successful career that spans almost 30 years and it assembles twelve short stories and four essays. All stories read well as standalone although a few of them are connected to her novels. From horror to comedy and from science fiction to fantasy, from young protagonists to more mature ones, from girls in positions of power to women whose power and choice have been stripped from their hands, the stories presented here cover multiple genres and narrative voices. The most delightful light story is the comedic “To Be A Man”, set in the Spiritwalker world in which a secondary character of that trilogy has a sexual encounter with a couple of ladies. The most harrowing, heart-wrenching one that basically destroyed my soul (then put it back together) is “The Gates of Joriun”, where a woman is serving a horrible, unfair sentence, trapped in a cage hung from outside the gates of a city that hates her and doesn’t even know how long has it been – this is a story where it’s possible to think about agency even if the character stands from a constricting point of view. It makes me think of all those times one criticises the lack of agency of female characters in stories only to then be confronted with the excuses of this is how the world is – well, in “The Gates of Joriun” this is how the world is and yet, look at the character, and the many ways the story remains about her and her choices. It is possible to have the entire world against a character and still make it all about them – the internal lives of women can still be rich and varied even if external forces restrict them. But I digress. “Leaf and Branch and Grass and Vine”, an older woman goes on a quest to save her town and uses nothing but her wits whenever difficult situations arise during her journey. In “The Queen’s Garden”, sisters faced with their father’s patriarchal tendencies in a matriarchal society take the matter in their own hands to a deliciously twisted conclusion. “Riding the Shore of the River of Death”, a Crown of Stars story, opens the collection with a bang: a young protagonist from a society with strict gender roles learns of a possible, different, other future and goes after it. There is even one story – “My Voice is in My Sword“ – that is all about the dynamics within a theatre group as they prepare to enact Macbeth to empathic aliens. It’s fantastic, because that fraught dynamics becomes the focus of the narrative in an unexpected way. And then we have the essays. There are four, previously published online (one of them was included in Speculative Fiction 2013) and they ponder the themes present in the story: from problematic male gaze to questioning the status quo, the essays are a treat and the perfect way to end the collection. The framing of The Very Best of Kate Elliott is clear: feminist stories featuring a diverse group of female characters presented in a variety of roles and journeys. The most obvious extrapolation here for me given my personal interests is how topical and important this collection is as it fits into an ongoing conversation about places for women – as writers, readers and characters – in SFF. The fact that I absolutely loved every single story and every single essay is just the cherry on top of Mount Awesome. There is a little bit of everything here and something for everybody. This is a great collection, a fun collection, an important collection, a highly recommended collection. 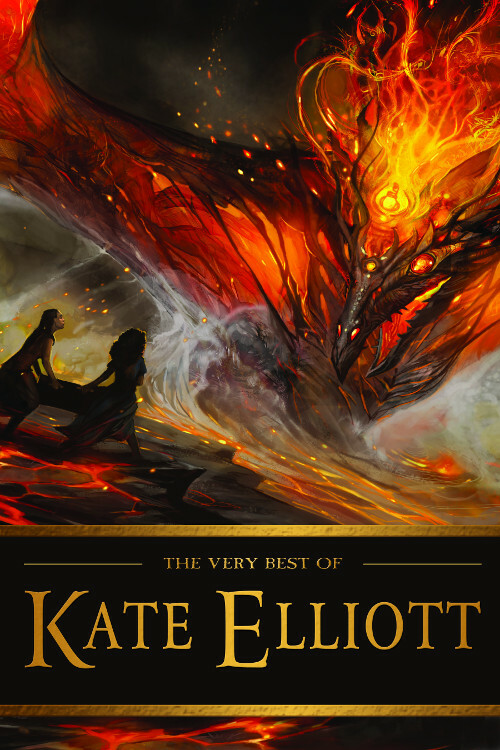 The Very Best of Kate Elliott is the very best that genre fiction can offer. For more about the collection, Renay and I talked about it at length in our podcast, Fangirl Happy Hour. You can listen to it HERE. In addition, we posted a wonderful essay from Kate Elliott, on being invited to produce this collection and her thoughts on self rejection: The Courage To Say Yes. Buy direct from Tachyon: HERE. I felt like the essays were the most important part of this book. Elliot addresses the unconscious framing that authors do, which results in skewed perspectives that leave female characters at a disadvantage. I’d call it required reading for fantasy authors that want to write to a female audience (or at least want to avoid unintentionally offending a female audience). @Zen DiPietro: I agree! I would go even as far as saying it’s required reading for readers and reviewers too – we all have the unconscious internalized framing. Ooh, I think I’m really going to enjoy reading this one! Great review! I’ve read amazing things about Kate Elliott, but so far have managed never to read anything by her. Does anyone have a suggestion of where to start, or does it even matter?